Tempera Mini Cakes make classroom distribution easier than ever. Each cake measures 1-5/8"Dia × 5/16" thick. Choose standard or metallic colors, in open stock or convenient sets. Metallic Colors, Set of 9 — This set contains Gold, Copper, Yellow Gold, Mirror, Charcoal, Aquamarine, Blue, Deep Gold, and Orchid in tray that measures 7¼" × 7¼". 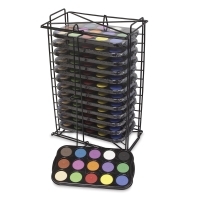 Tempera Rack with 12 Sets — Great for a classroom, this black wire storage rack comes filled with 12, 15-Color Sets in heavy-duty trays. Each set includes Black, Brilliant Blue, Brilliant Green, Brilliant Yellow, Burnt Sienna, Burnt Umber, Cerise, Crimson, Flesh, Leaf Green, Orange, Purple, Turquoise, Violet, and White cakes. The rack measures 20-1/2"H × 13"W × 7-1/2"D.
Fluorescent Colors, Set of 6 — Make artwork pop with this neon-powered set that includes Fluorescent Yellow, Fluorescent Pink, Fluorescent Blue, Fluorescent Red, Fluorescent Green, and Fluorescent Orange in a reusable black plastic tray. 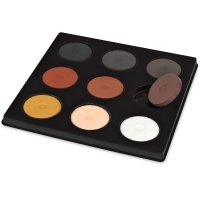 More Colors, Set of 9 — The set includes Burnt Sienna, Burnt Umber, Cerise, Cobalt Blue, Gamboge, Leaf Green, Vermilion, Violet, and Yellow Ochre in a reusable black tray. Metallic Colors, Set of 6 — This set contains Gold, Copper, Mirror, Charcoal, Blue, and Orchid in a tray that measures 5" × 7¼". 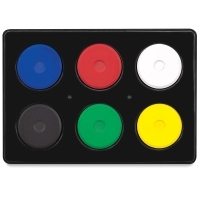 Standard Colors, Set of 6 — This set includes Blue, Yellow, Red, Green, Black, and White Tempera Mini Cakes in a reusable black plastic tray. When the cakes are used up, just pop in the Refill Set (sold separately below). Standard Colors, Set of 9 — This set includes Blue, Yellow, Red, Green, Orange, Purple, White, Black, and Turquoise in a reusable black plastic tray. When the cakes are used up, just pop in the Refill Set (sold separately below). 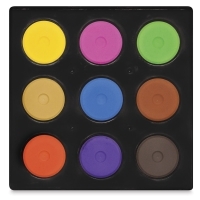 Multicultural Colors, Set of 9 — This set is ideal for depicting all the skin tones of the world. It includes Black, Van Dyke Brown, Burnt Umber, Burnt Sienna, Sienna Brown, Light Brown, Yellow Ochre, Flesh, and White cakes in a black tray. 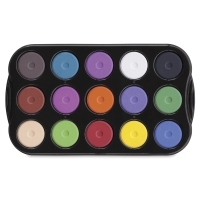 15-Color Set with Heavy-Duty Tray — This tray fits in the Tempera Rack (sold separately). Set includes Black, Blue, Burnt Sienna, Burnt Umber, Cerise, Flesh, Green, Leaf Green, Orange, Purple, Red, Turquoise, Violet, White, and Yellow.